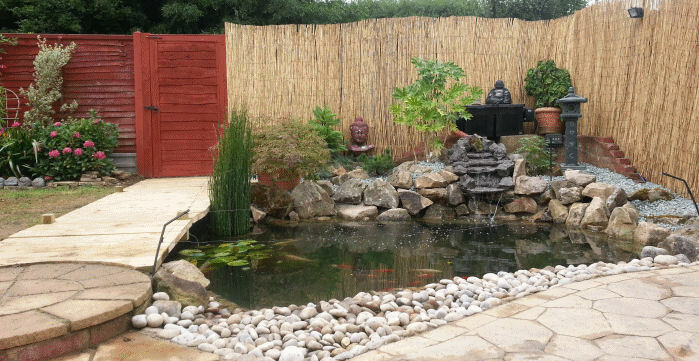 We look to design each pond with as much input as possible from our clients, this enables us achieve their dreams, whether it’s a crystal clear Koi pond or a traditional garden pond to enjoy during those warm summer evenings. Essential Ponds offer a comprehensive range of waterscape services catering for every aspect of pond cleaning, pond design, pond construction, pond maintenance as well as fish and aquatic pond plants sourcing and also supply a wide range of landscaping services. Essential Ponds specialise in all aspects of pond design and construction, we offer a complete planning to planting package, and use a wide range of construction methods including the traditional rubber/pvc/Butyl lined ponds, brick/block raised garden ponds as well as rendered concrete and Natural Ponds constructed with a natural clay soil. Part of our Design & Construction package also includes calculating and supplying suitable pond pumps, filtration systems, ultra violets (UV) and all necessary pipe work and fittings to complete your dream pond or waterscape.